Watermelon diet. 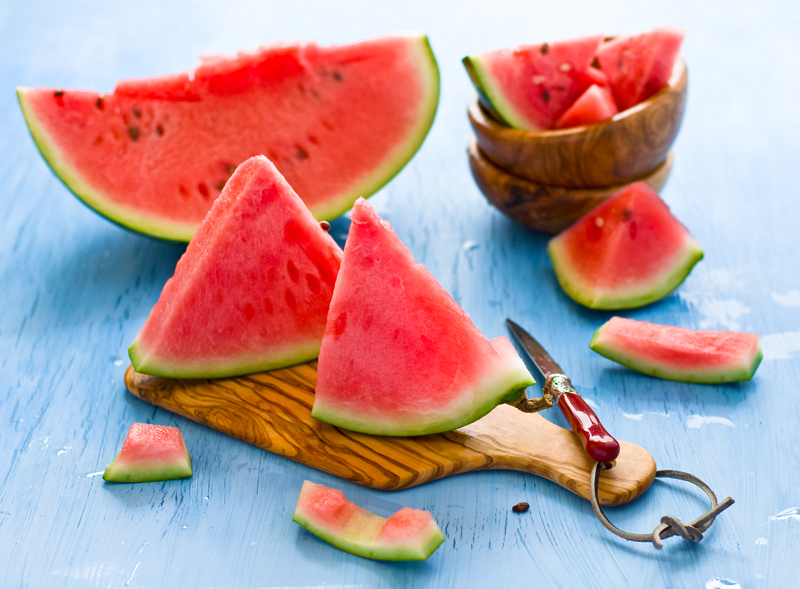 Watermelons are great for weight loss because they contain 90% water. Except that will you enter enough fluids in the body, watermelons contain vitamins and minerals. Other than that, not even one of the necessary ingredients will be lacking if you consume watermelons as part of low calorie diet. The meat of watermelon does not contain cholesterol and almost does not contain fats. It contains a lot of potassium and vitamin A, C, B6 and because it contains over 90% water it meets your daily needs for water. Watermelon contains lycopene, which studies confirm that it is the most powerful antioxidant. Watermelons are a natural diuretic; therefore it is used as assistants in attenuation. Also because it contains 90% water watermelon is used in detoxification programs to detox the body. Sweet flavor with few calories is a good alternative to high calorie desserts. You can combine it with other fruits to make delicious diet desserts. This diet has great detoxifying effects, lasts only 5 days and introduces a wider food variety. This watermelon diet is effective, as long as you stick to the meal plan. Breakfast is same every morning: Slice of watermelon, 50 grams of bread toast and a cup of tea. Every day drink 12 cups of water, tea or fresh fruit juice. Lunch: 100 g boiled beef, 100g cooked rice with tomato sauce, 1 slice watermelon. Dinner: 50g white (without salt) cheese, 1 slice of toasted bread, watermelon optional. Lunch: toasted bread, 60 g of boiled chicken or turkey meat, 1 slice watermelon. Dinner: 100g boiled fish, 1 piece of toast, 1 slice watermelon. Lunch: 30 g pasta with cheese and tomato, watermelon optional. Dinner: salad of tomatoes, cucumbers, peppers, onions and lettuce, 1 slice watermelon. Lunch: 1 bowl of vegetable soup, 1 slice of toasted bread, 50 g boiled chicken, 1 slice watermelon. Dinner: 2 boiled potatoes with parmesan cheese, watermelon optional. Lunch: 50g boiled beef with mushrooms, watermelon optional. Dinner: 50g fresh (without salt) cheese, 2 slices of toasted bread, watermelon optional. This meal plan is in fact low-calorie diet. If you don’t have any health problems the Watermelon diet won’t do you any harm. Nevertheless, the severe calorie restriction and little food variety can make you prone to overeating once the diet is over. As soon as you get off this diet plan try to incorporate whole, nutritious foods in your meals and stick to regular-sized portions. If you’re also exercising during this diet you should keep your workouts light. Since the Watermelon diet provides only few calories, you may feel tired, dizzy and/or lightheaded if your workouts are too intense. If you experience these or other unpleasant symptoms it’s definitely recommended you stop following this diet.